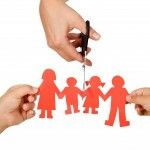 Coming to terms with the fact that their parents are getting divorced can be difficult for children. With a major concern of their children’s welfare, sometimes parents continue living in unhappy marriages to save children from the trauma that is associated with divorce. However, divorcing parents can be hopeful that their children won’t necessarily be affected by it, since researches state that divorce is troublesome for only a small percentage of children. According to research, after the initial blow of divorce which leads to feelings of shock, disbelief, anger or anxiety, children recover rapidly. These effects are short-lived and, with a few exceptions, disappear after the second year. Also, children from divorced parents don’t usually show negative signs in adolescence or teenage in matters concerning self-confidence, academic achievement or social relationships. It is better that children are aware of any parental-discord before the divorce so that it doesn’t come as a rude shock and they adjust with it easily. It is important to note that signs of depression or serious social or emotional troubles in adult children coming from divorced parents are not significantly high than the children coming from stable families. However, it is difficult to state if divorce or variables like poor parenting are responsible for it. As adults, these children can have problems getting into intimate relationships; have unsatisfied marriages or higher divorce rates. With efforts of parents to keep children away from divorce conflicts, children can bounce back easily. It is important that there is at least one well-functioning parent who is looking after them properly. If necessary, professional help must be taken by the primary parent. Talking to children and providing warmth, moral and emotional support can be helpful. Keeping their temperament in mind, they should be dealt with accordingly.